Dear Readers, last Friday my friend J and I went to Kew Gardens, which is usually an oasis of serenity in the hubbub of the city. However, it is the school holidays, and so we were greeted at the front entrance by a man on stilts, dressed as a tree. 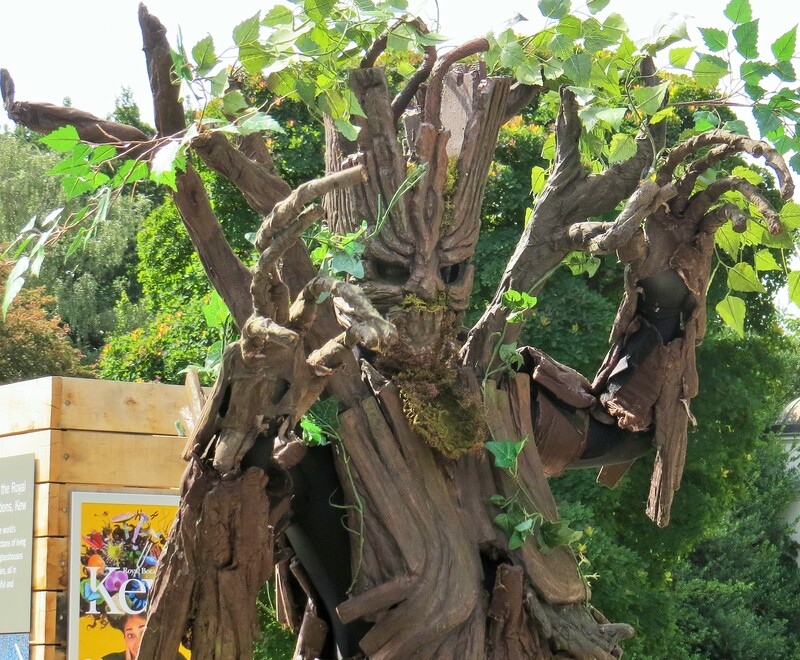 He looked rather like Groot from that exemplary film ‘Guardians of the Galaxy’, but he had rather more to say for himself. He looked at J’s legs. She was bare-legged and wearing sandals. ‘Oh,’, he groaned, ‘Your roots are exposed! I would get some water on them if I was you’. In spite of his enormous size and scary appearance, he had a great way with children, who didn’t seem the slightest bit afraid of him. 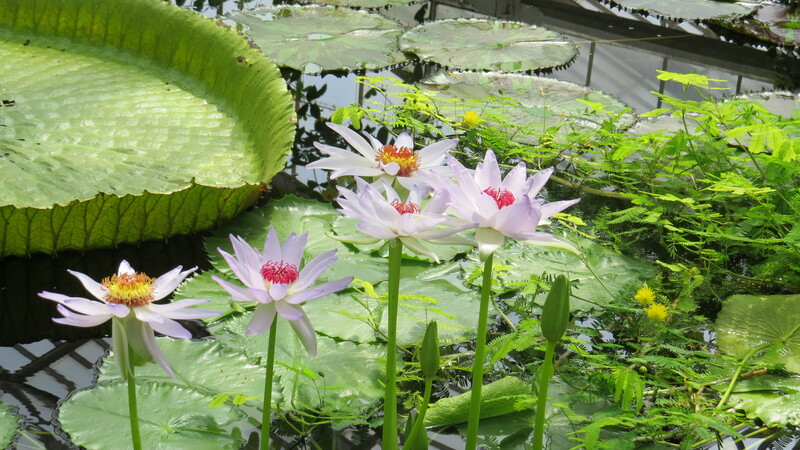 Having bid our woody friend farewell, we moved on to the Water Lily house. This is a fine Victorian building, all cast iron and glass, and was built for the huge Victoria water lilies that were brought back from the Amazon. However, these plants didn’t do so well here and were moved to the Princess of Wales Conservatory (of which more later). The house is now home to many Nymphaea water lilies (plants of this genus are the ones we often see growing wild in the UK). I had no idea that they came in so many colours: there were purple ones with yellow middles, pale pink and red ones, magenta ones. Water lilies are fascinating plants – they are largely thought to be amongst the earliest flowering plants, as their various organs are not as diverse or specialised as in later plants. Some of them are pollinated by beetles, and they do this by first attracting the beetles with a heavy, spicy scent. They then close so that the beetles are trapped overnight and get covered in pollen, In the morning they release the prisoners so that they can do the same in a different flower the following night. Flowers that are pollinated by beetles (which is called cantharophily, another new word to me) tend to have large, open, dish-shaped flowers, lots of pollen, and have their ovaries well hidden from the jaws of their pollinators. 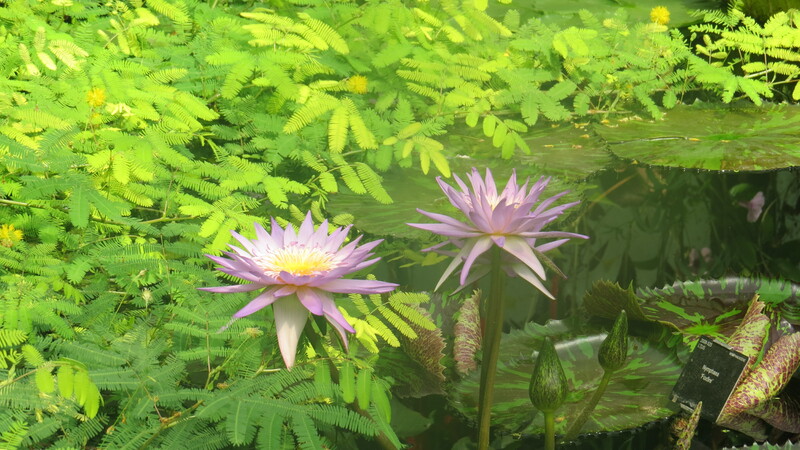 I was fascinated by how clean the water was in the Water Lily house – I had thought that, in the humid atmosphere, there would be plenty of opportunities for algae to grow. However, there are apparently fish in the water, which help to keep it clean, and the staff at Kew also dye the water black with harmless food colouring – this explains how pristine it all looks. 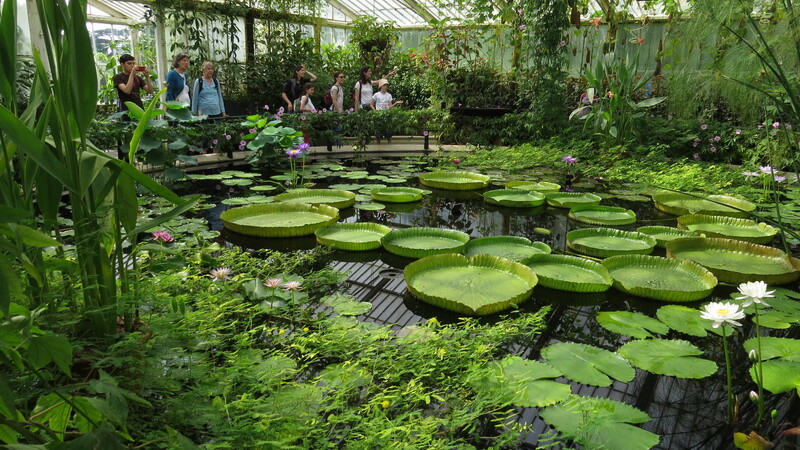 We headed over to the Princess of Wales Conservatory to have a look at the Victoria water lilies. When we got there, there was a crowd watching two workers who were in waders amongst the lilies, pulling out any rotting vegetation. It makes me feel a little guilty that I’m not doing the same in my pond, but then it is a lot warmer in the glasshouse. 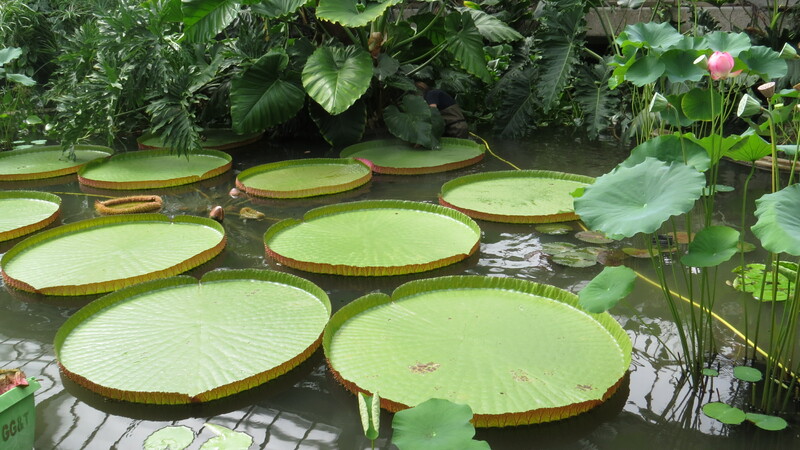 The leaves really are enormous, and when the Victoria Waterlily was first brought to the UK, there were publicity photos of a small child sitting quite happily on one of the lilypads, like a human frog. 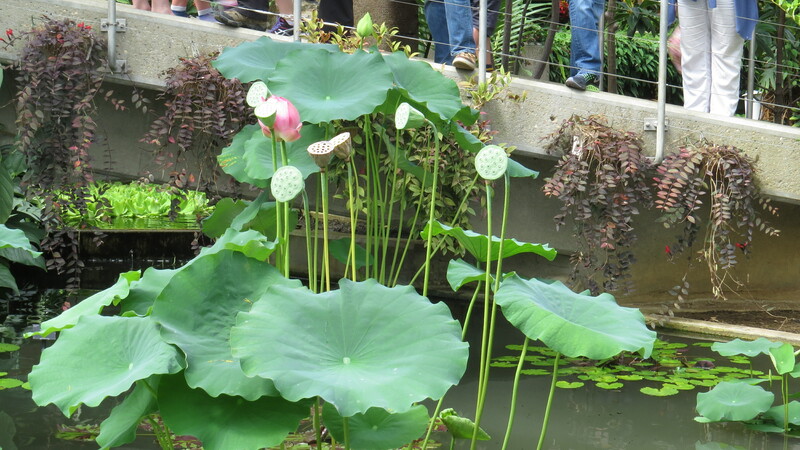 I don’t have a photograph of this, but I do have one of a woman standing on a lilypad at the Missouri Botanical Garden for your delectation. 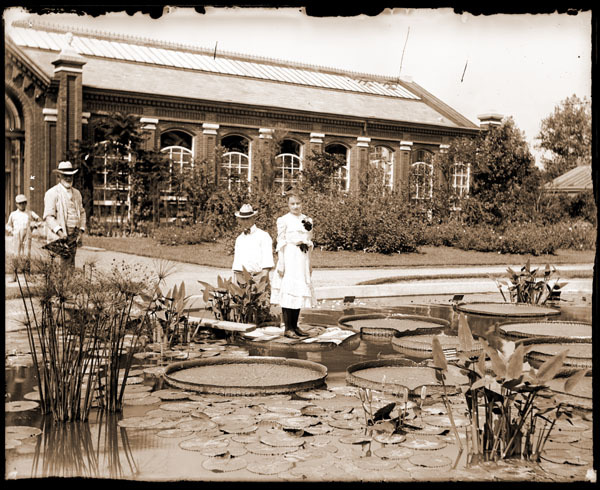 A woman standing on a Victoria Waterlily pad, courtesy of Missouri Botanical Gardens. There is a towel and a piece of wood on the pad to protect it. Alongside the lilies there was another plant that looked vaguely familiar. 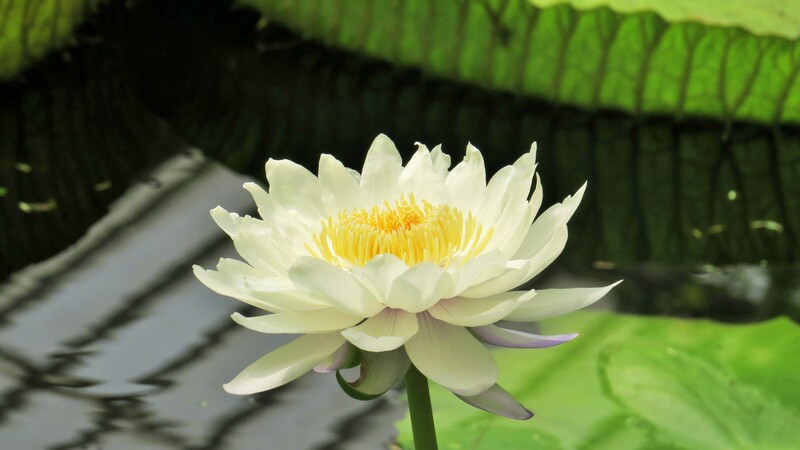 This is the Lotus, the sacred flower of Buddhist and Hindu tradition. I love the watering can seedheads, and the way that the petals gradually unfold to reveal the flower’s beauty. 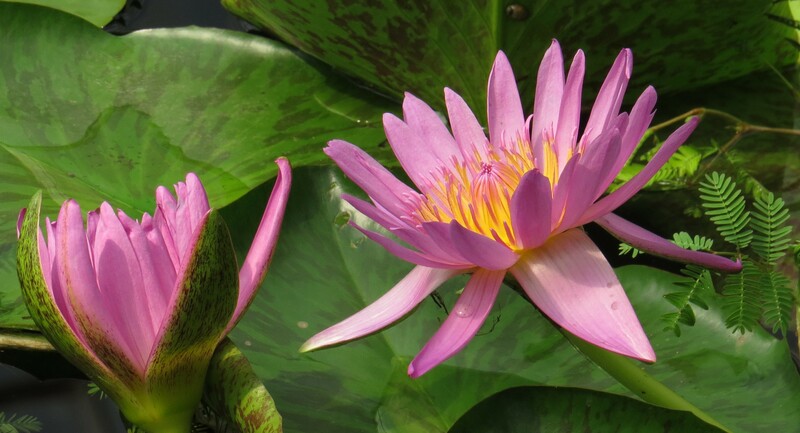 Although it lives in a similar habitat to the waterlily, and superficially resembles it, there is only a very distant relationship between the two plants. 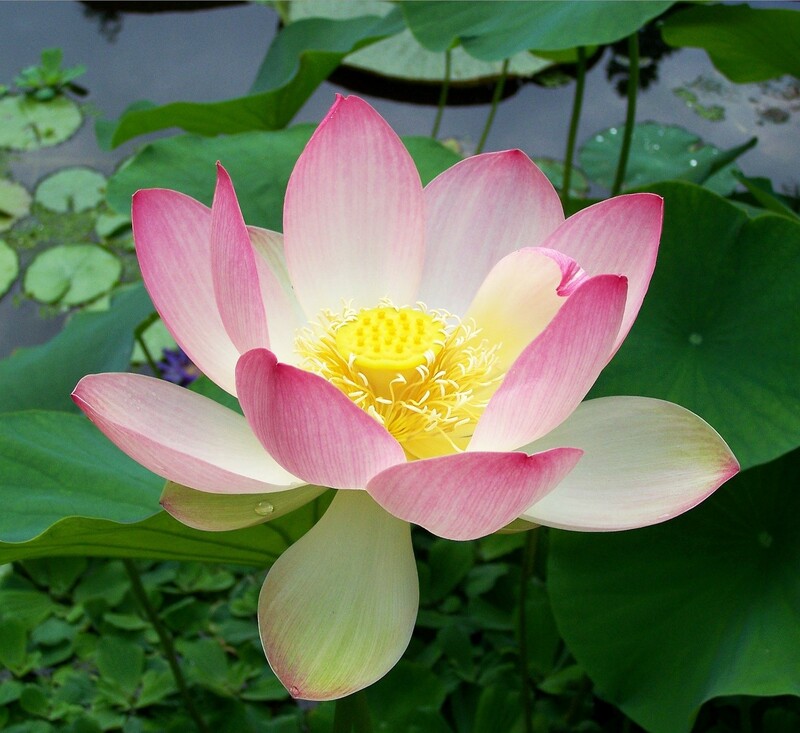 Lotus leaves are extremely water-resistant, and have given their name to a self-cleaning mechanism called ‘the lotus effect’. 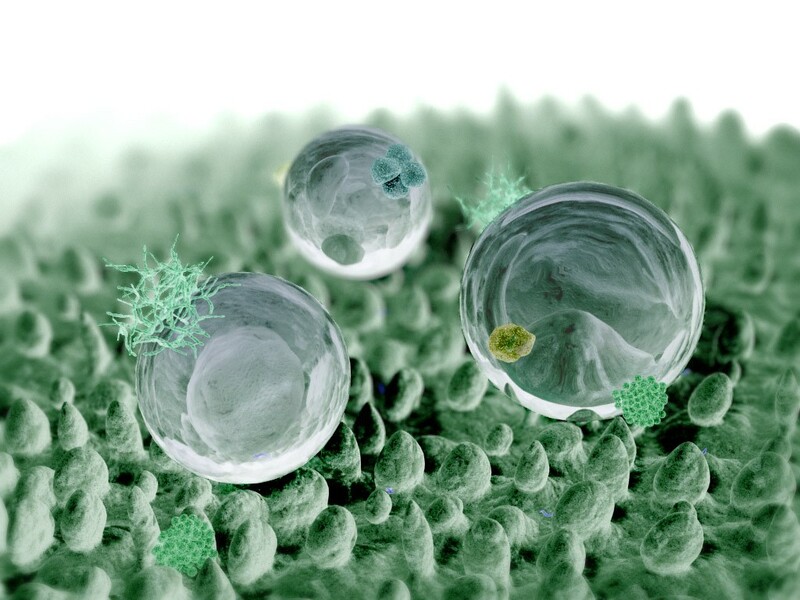 The leaves have a quality called ‘superhydrophobicity, which means that water droplets cannot cling to the surface, and take any dirt with them when they drop from the plant. This ability has been analysed by scientists, and used as a coating for such things as roof tiles and paint. The ‘lotus effect’ itself was first noticed as far back as the Indian classic work the Bhagavad Gita (probably written in the fifth to second century BCE), which just goes to show that there is nothing new under the sun. 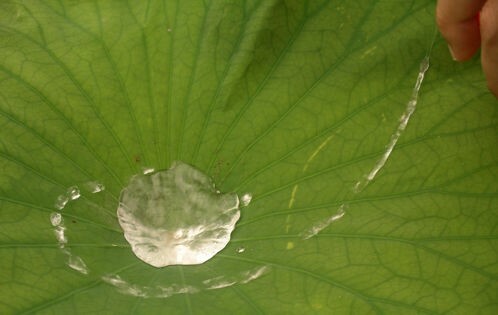 A Lotus leaf showing its extreme hydrophobicity. Photo One – see credit below. Like the water lilies, lotus flowers emit a scent to attract insects to pollinate them, but they are also able to regulate their temperature, which increases the strength of the aroma, and also supplies the insects with a warm, cozy home on which to feed and breed. With their roots in the mud and their perfect unstained flowers, it is no wonder that in Buddhism lotus blossoms symbolise purity of speech, mind and body rising above the attachments and desires of the unenlightened state. Lotuses seem to me to be full of a kind of august dignity. The fact that individual plants can live for over a thousand years and that a seed 1300 years old was successfully germinated in 1994 adds to the impression. 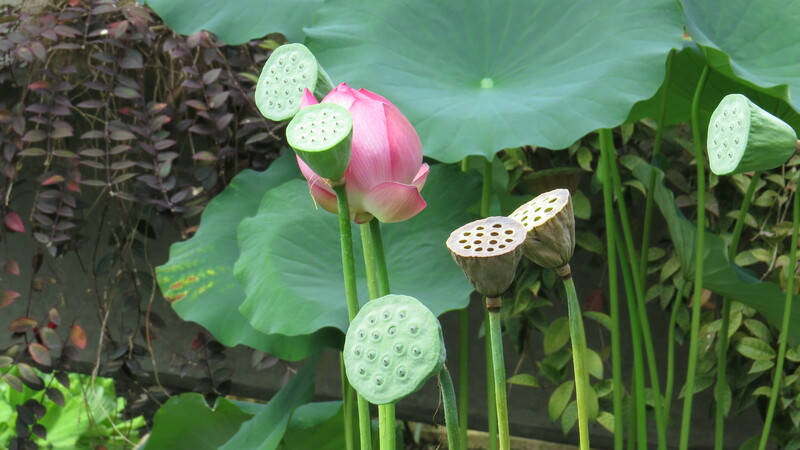 What stately plants both waterlilies and lotuses are! And the Princess of Wales Conservatory had one more surprise to hand. 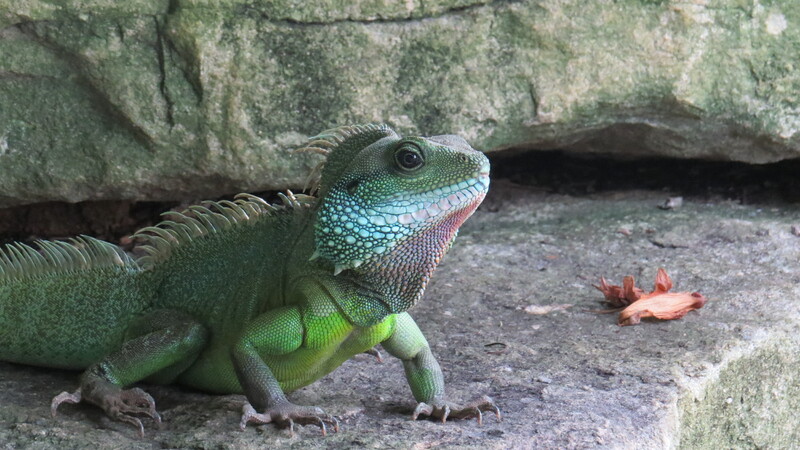 There on a rock was a Chinese water dragon, a kind of lizard. He looked completely unperturbed by all the visitors who were taking his photograph, and was much more interested in a hidden rival, who he was threatening by bobbing his head up and down. On my return home, I did some research and discovered that there are nine of these creatures living ‘free-range’ in the conservatory, keeping down the numbers of pests and roaming and breeding happily away. I suspect that they are the happiest lizards in London. All other photographs copyright Vivienne Palmer. Free to use and share non-commercially, but please attribute and link back to the blog, thank you! This entry was posted in Bugwoman on Location, London Places, London Plants, London Reptiles on August 13, 2016 by Bug Woman. My word, you do manage to teach me such a lot – thank you! Thank you for reading and commenting, Toffeeapple! The vigilant fellow guarding his spot reminded me of a gargoyle, albeit a far more dapper one than those gray wannabes peering from the heights of ancient cathedrals. Thank you for so many surprises! You’re welcome, Katya! Hope all’s going well for you. How is the courtyard garden? I’m very well, thank you, as I hope you are. At the moment, my wee garden is taking those first baby steps toward its annual bedraggled stage as summer begins to pack up its regalia and prepare for fall. A trumpet vine I planted about 10 years ago finally produced more than just 2 or 3 glorious orange flowers this season, managing at least 20 (! ), and a dwarf hydrangea I promised not to kill by overwatering, has bloomed its heart out! The ferns and hostas have dutifully spread, bless them, so it’s been a thriving summer this year. Sunlight is confined mostly to about 3 or 4 hours in the morning; herbs are always happy, but roses or other flowers requiring loads of direct light would just sit in their pots being sad, as wallflowers at a dance, so I pretty much gave up on them. I’m not complaining though, being so very fortunate to have such a spot within the concrete jungle! One of the loveliest events in the garden has been daily visits to a small feeder I put up and filled with sunflower seeds. A cardinal pair, who appear to be deeply in love, and their newly fledged brood, who wait with them for the bounty, flapping their little wings in anticipation, pa visits throughout the days. What a joy that is! Looking forward to more wonderful posts on your blog!